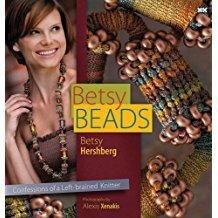 Betsy Beads uses commonly available materials to knit beaded items with uncommon polish. Betsy frames the issues to consider when choosing fibers, beads, knitting needles, and closure options. Betsy Beads introduces basic bead knitting techniques, then shows how to use them to make Betsy's beaded components: chains, beads, flat straps, fabrics. 5 construction-technique-based sections feature over 30 projects: necklaces, bracelets, earrings, evening bags, belts, suspenders, scarves, headbands, Christmas and Easter ornaments, and a yarmulke! Each section begins with easy Tech Trial pieces so knitters can learn the techniques with stash yarn and beads before trying one of Betsy's designs or building one of their own. Jewelry often has no wrong side and Betsy's Tech Tips reveals how to keep beaded knitting 360-visible.